Digital image of high-spy view of recumbent stone circle. View of circle from the south-east. 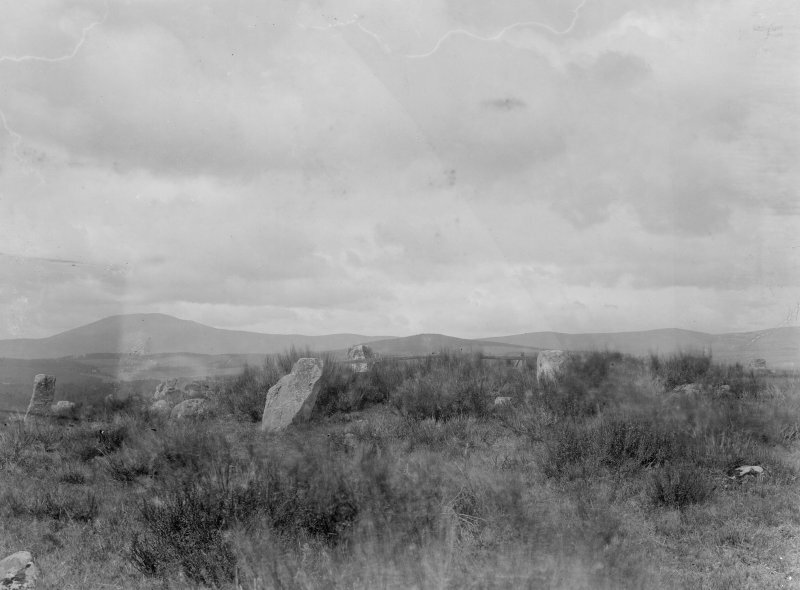 Original negatives captioned: 'Stone Circle on Tom-na-hivrigh (Tomnaverie) near Tarland 1904', and 'Stone Circle on Tom-na-hivrigh (Tomnaverie) west of Wester Coull / View from South East showing Recumbent Stone and fallen pillars July 1904'. 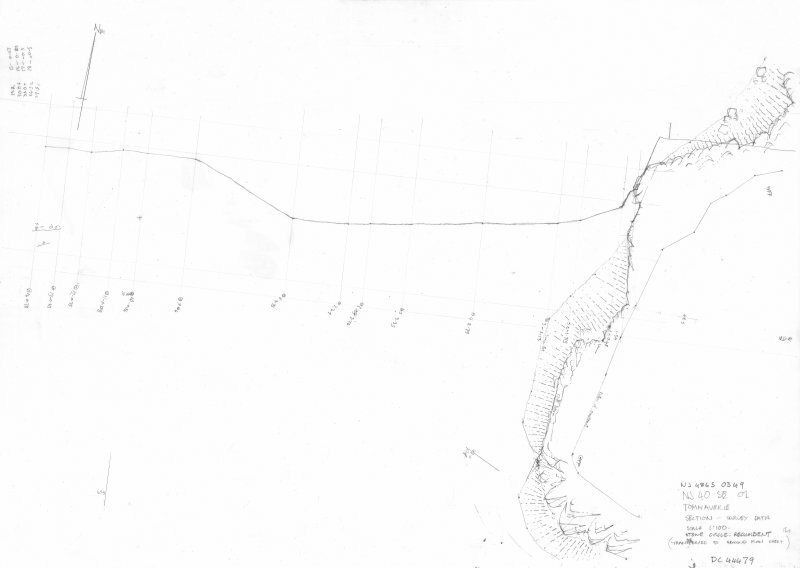 Sketch of recumbent stone circle from S.
General view of stone circle from the east. 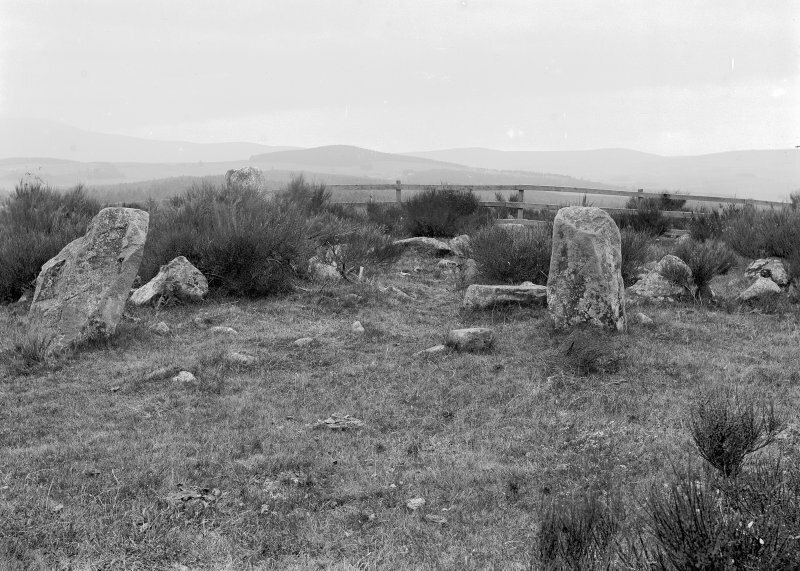 Original negative captioned: 'Stone Circle on Tom-na-hivrigh (Tomnaverie) on farm of Mill of Wester Coull near Tarland July 1904. View from East side showing Stone Setting / Tom-na-hivrigh = Hill of worship or justice'. 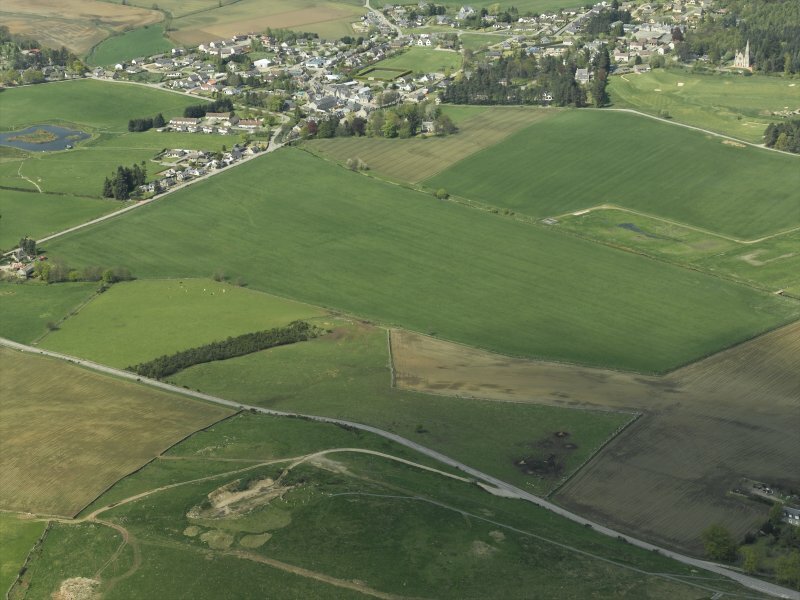 Oblique aerial view centred on the remains of the recumbent stone circle, taken from the SW.
General oblique aerial view of the remains of the recumbent stone circle with the village in the background, taken from the SE. 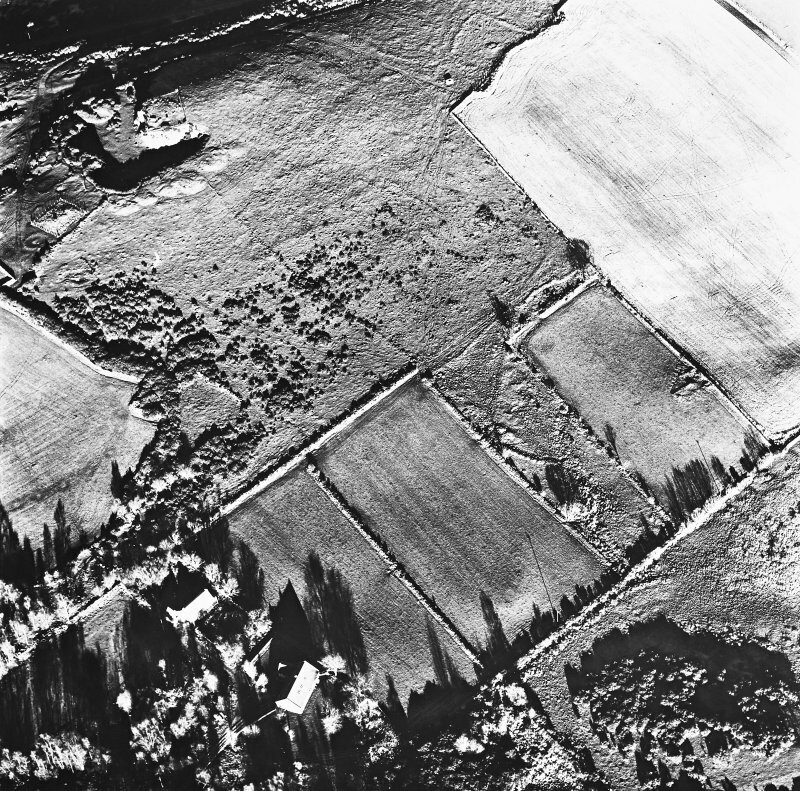 Oblique aerial view centred on the remains of the recumbent stone circle, taken from the SSW. 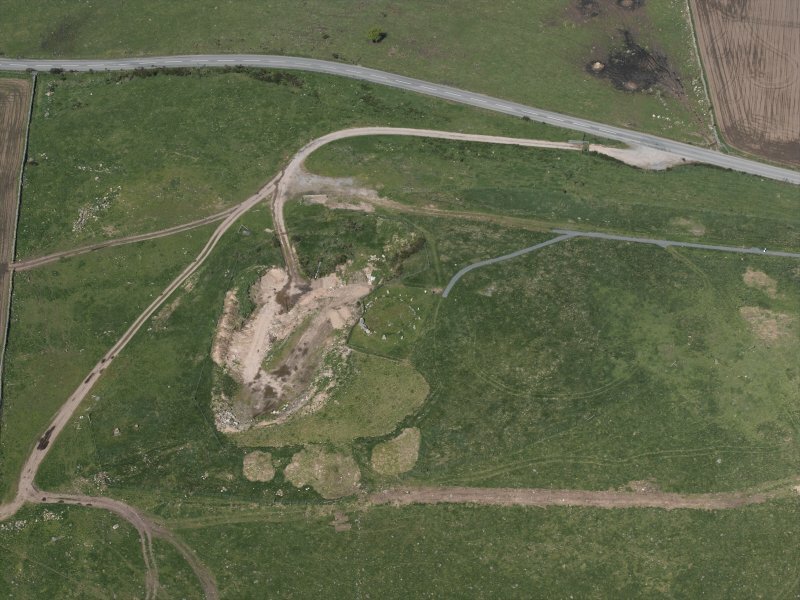 Oblique aerial view centred on the remains of the recumbent stone circle, taken from the WNW. General oblique aerial view of the remains of the recumbent stone circle with the village in the background, taken from the ESE. The Tomnaverie recumbent stone circle is situated on the crest of a hill beside a disused quarry. 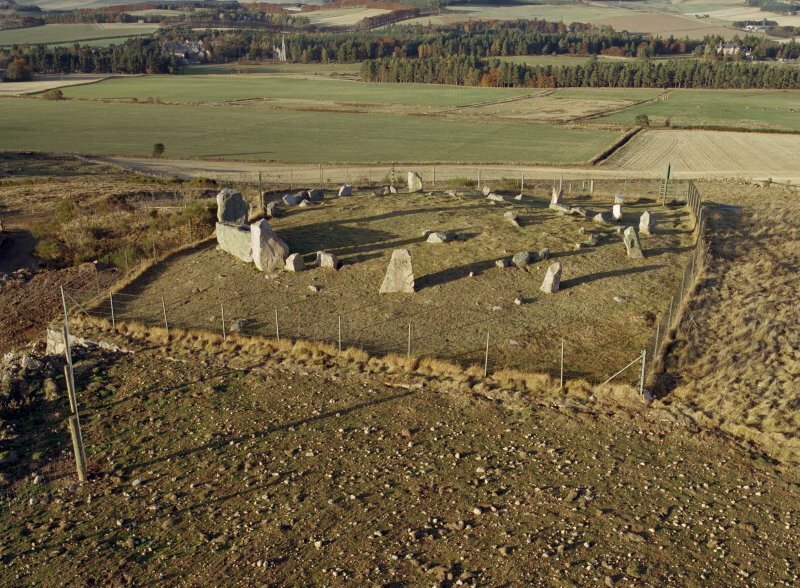 It consists of an incomplete outermost ring, 56ft (17m) in diameter, comprising the recumbent stone, its two flankers (fallen), five erect stones and one fallen stone, a middle setting of stones which, without excavation, is impossible to explain, and an innermost setting of smallish stones, 28ft (8.5m) in diameter. The recumbent stone is situated more towards the east than is usual and has probably been moved forward about two feet. A few years ago one of the standing stones near the edge of the quarry was undermined, fell, and has disappeared. F R Coles 1905; R W Feachem 1963; J Ritchie 1917. The outermost circle remains as described except that the west flanker appears to have been moved outside the circle. A kerb of stones c. 14.0m in diameter appears to have been joined to the two flankers and may be the middle setting referred to above, while the innermost setting is now merely a rickle of stones with slight traces of what may be the inner kerb of a ring cairn. Visited by OS (RL) 15 October 1968. This recumbent stone circle is situated in an area of grassland and heather on the crest of a hill. The remains of the (incomplete) outer ring (which has measured about 17m in diameter) comprise the recumbent stone itself, two (fallen) flankers, five erect stones and a fallen stone; the kerb measures about 14m in diameter and is joined to the two flankers. The inner setting has been reduced to a rickle of stones (measuring 8.5m in diameter) with slight traces of what may be the inner kerb of a ring-cairn. Information from Aberdeenshire Archaeological Service, June 1997 (visited 17 May 1992). NJ 486 034 This was the first of two seasons of excavation at a guardianship monument. 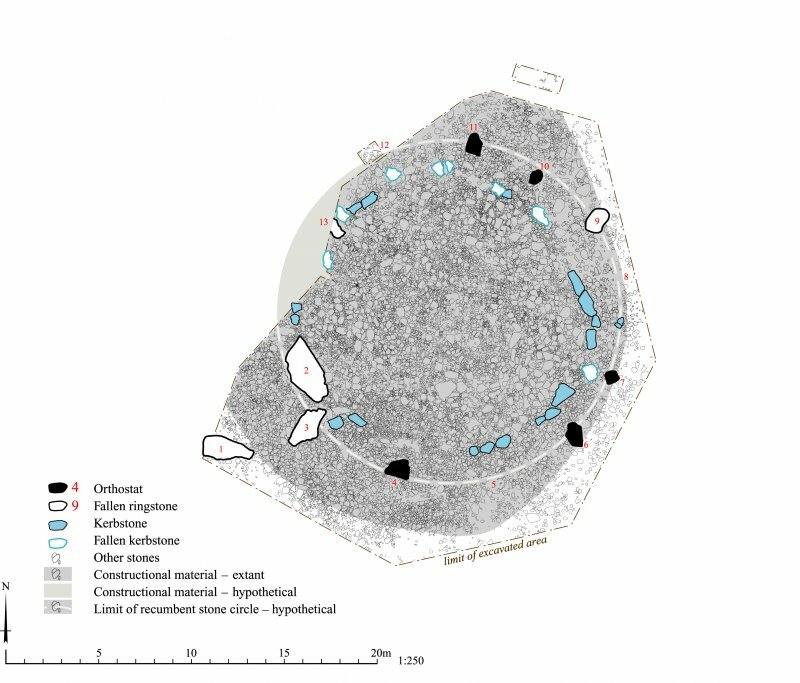 The work had three main aims: to establish the state of this damaged stone circle and to formulate plans for its interpretation and display; to establish the sequence of the different structural elements on the site; and to obtain material for radiocarbon dating. The monument proved to be unexpectedly well preserved, despite some damage from an adjacent quarry which continued to operate into the 1920s. 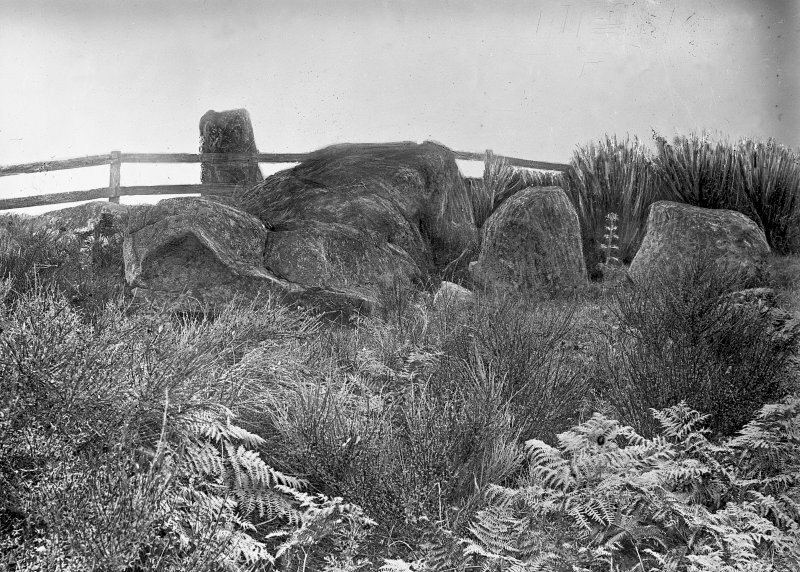 The site had three structural elements: a central ring-cairn, with a massive rubble core and a series of fallen kerbstones; a circle of monoliths, including a recumbent stone and two flankers which had been taken down and moved away from the quarry edge; and an outer platform of rubble which created a level base for the entire monument. It seems as if all these elements were constructed together and that the ring-cairn was built at the same time as the recumbent stone circle and the outer platform. In fact, that platform supported the monoliths of the stone circle, provided the foundation for the recumbent and buttressed the outer kerb of the ring-cairn. Small quantities of cremated bone were observed in the central area which has yet to be excavated, and quantities of charcoal were recovered from the old land surface beneath the original position of the recumbent stone. The only artefacts contemporary with the recumbent stone circle were pieces of worked flint and quartz which cannot be dated accurately. NJ 486 034 A walkover survey was undertaken in the area around Tomnaverie stone circle (NMRS NJ40SE 1) in advance of proposals to improve access to the site. Several new sites were located, including an old road, agricultural enclosures and field banks. In the middle of one embanked enclosure was a mound, possibly a cairn or a kiln. A number of possible cup marks are located on boulders and bedrock close to the stone circle. A report will be lodged with the NMRS. NJ 486 034 This was the second and final season of excavation of the Guardianship monument (DES 1999, 7-8). 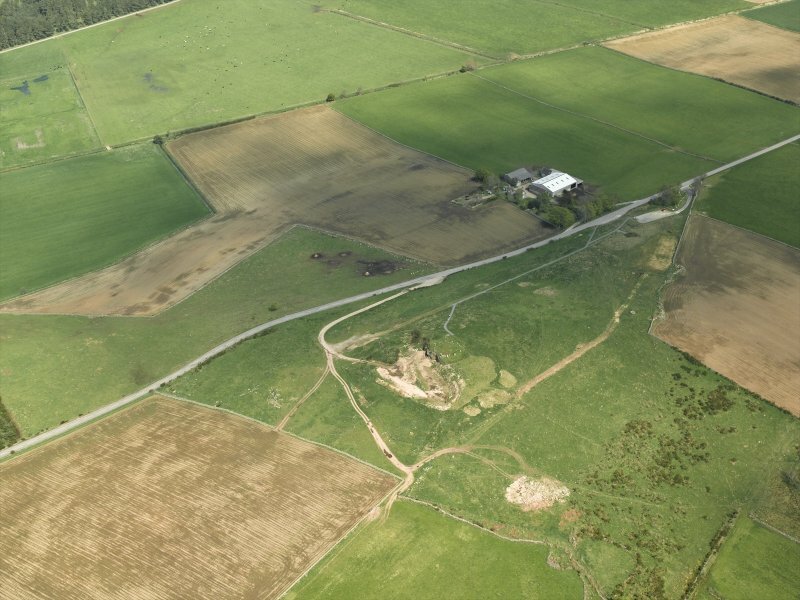 The work had three main aims: to establish the condition of this badly damaged stone circle; to work out the sequence of construction on the site; and to obtain dating evidence. Following the excavation the fallen or displaced stones were re-erected in their original sockets. 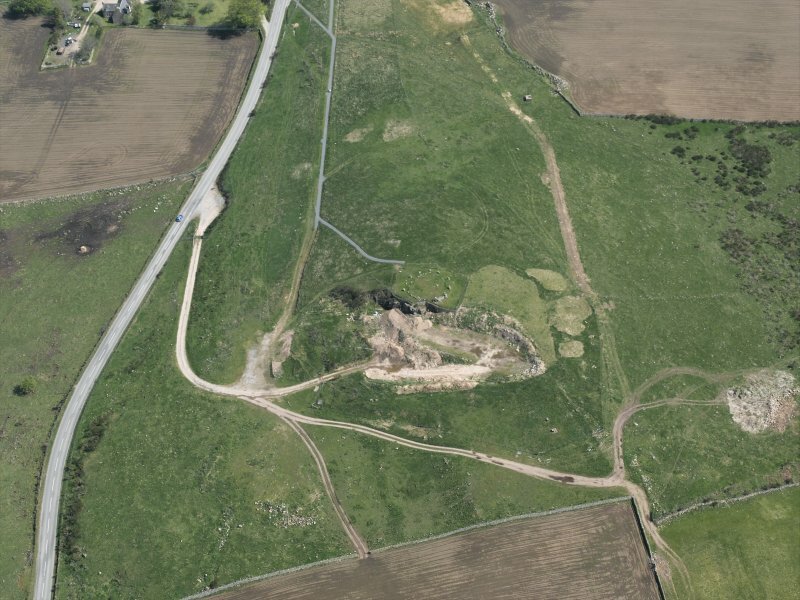 The earliest feature on the site was a cremation pyre on the summit of a low hill. This was identified by a spread of small fragments of cremated bone from an area of enhanced magnetic susceptibility. This was encapsulated within a polygonal cairn, open at the centre and defined by a massive kerb of slabs and glacial boulders. That kerb had been revetted on the outside by a bank of rubble which sealed a few sherds of Beaker pottery. At a number of points the interior of the cairn was linked to the outer kerb by radial divisions which seem to be a primary feature of the monument. In a subsequent phase the existing cairn was enclosed by a recumbent stone circle. The monoliths were set in sockets cutting through elements of the earlier monument, and the recumbent stone had originally rested on top of the bank of rubble supporting the exterior of the cairn. When this happened, one section of kerbstones was demolished and the cairn was extended to join the flankers on either side of the recumbent stone. In a later period, probably during the first millennium BC, a pit was dug in the exact centre of the monument to receive a cremation burial. 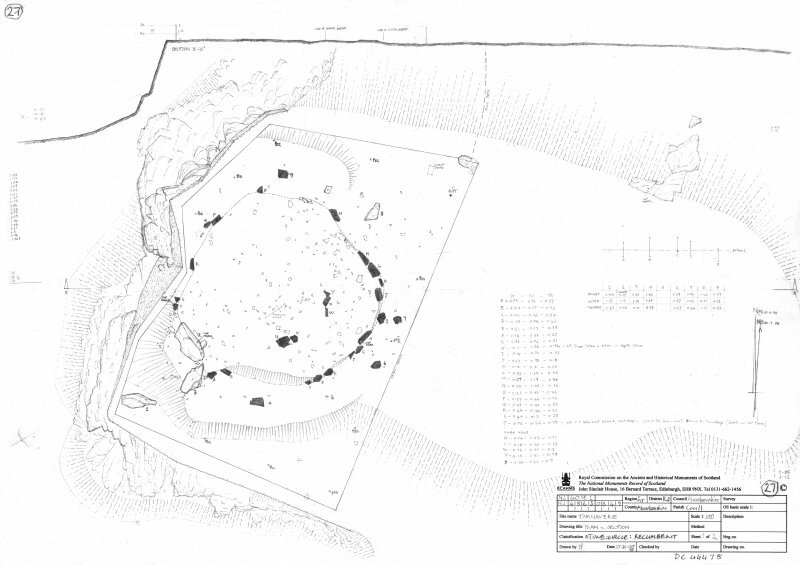 Survey of the uncleared areas of the hill identified the positions of 29 cup-marked stones. 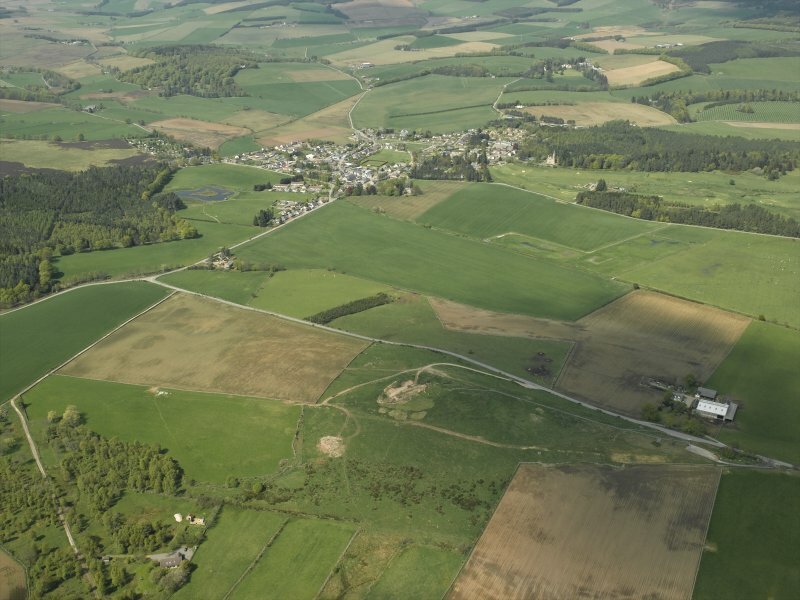 Fieldwalking on the ploughed land in the Howe of Cromar (a total of 86 fields) located the positions of six concentrations of lithic artefacts of approximately the same date as the stone circle. It seems as if the monument had been located on the outer edge of the settled landscape. NJ 486 034 A watching brief was maintained in November 2001 during the excavation of a new access path to Tomnaverie stone circle. 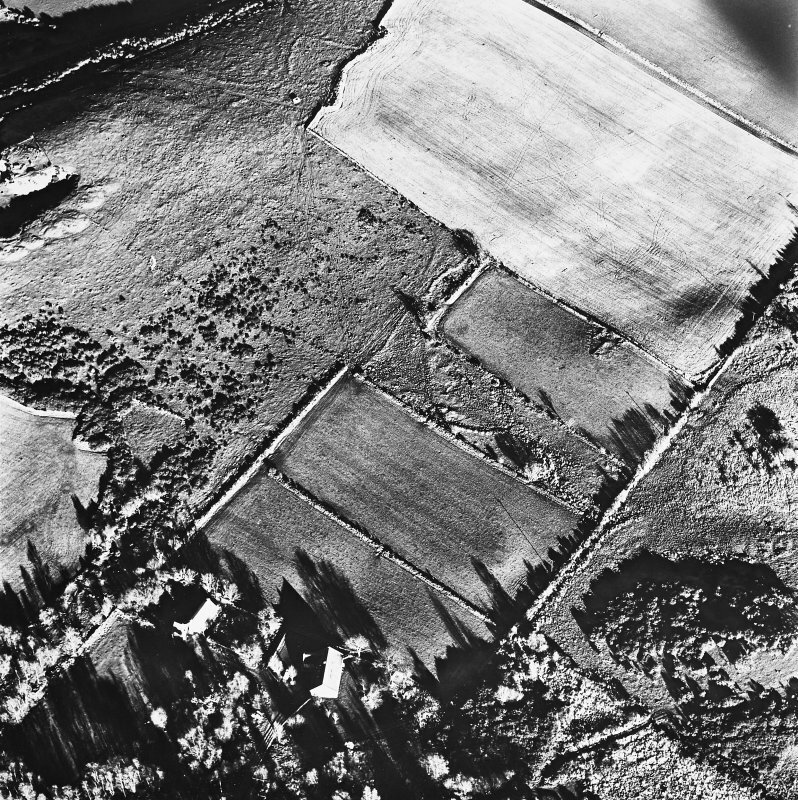 The only major site affected was the track running parallel to the modern road - this was found to be simply terraced into the hillslope, and unsurfaced. NJ 4866 0347 A watching brief was maintained in April 2003 while three small hummocks on the S side of the quarry bordering the stone circle were removed and the soil used as top dressing for the quarry infill. The backfilling of the quarry is part of a wider programme of works to improve the amenity of the stone circle. It was found that the hummocks accumulated when soil was stripped for the beginning of quarrying in the early 20th century. No archaeological features or finds were evident. Sponsor:	Tomnaverie Stone Circle Trust. Although part of the prominent little hill on which this recumbent stone circle sits has been removed by quarrying, the setting and the spectacular views south and west to the Caimgorms can still be appreciated. The recumbent, of whinstone, and four of the circle stones of pale red granite remain erect. The circle was about 18m in diameter and it surrounded a ring cairn, 14m across, whose substantial kerb still survives. Although part of the prominent little hill on which this recumbent stone circle sits has been removed by quarrying, the setting at the heart of the Howe of Cromar and the spectacular views south and west to Lochnagar and the Cairngorms can still be appreciated. The recumbent, of whinstone, and four of the circle stones of pale red granite remain erect. The circle was about 18m in diameter and it surrounded a ring cairn, 14m across, whose substantial kerb still survives. The visitor today encounters a circle measuring 17m in diameter, with eleven of its original complement of thirteen stones upright and an imposing recumbent setting on the SW (1–3); the gaps for the missing orthostats are on the WNW (12) and NW (13) respectively. All three stones of the recumbent setting have been re-erected, the recumbent (2) having fallen backwards and the two flankers forwards, only for the western (1) to be displaced even further down the slope (see below). The recumbent, which measures 3.2m in length by 1m in breadth and up to 1.15m in height, is a roughly trapezoidal block containing inclusions of quartz. 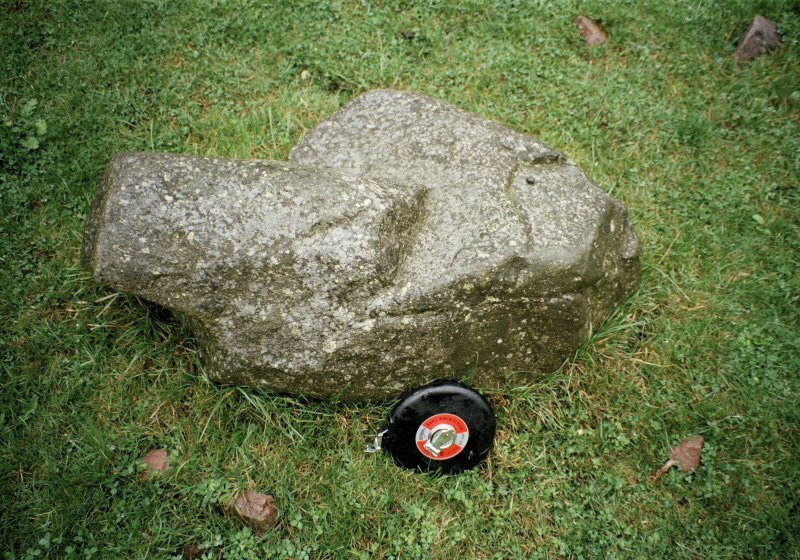 It bears two cupmarks, one on its relatively even summit and the other on its rear, where there is also a natural hollow that Bradley has likened to a bronze flat axe (2005, 32, fig 49). 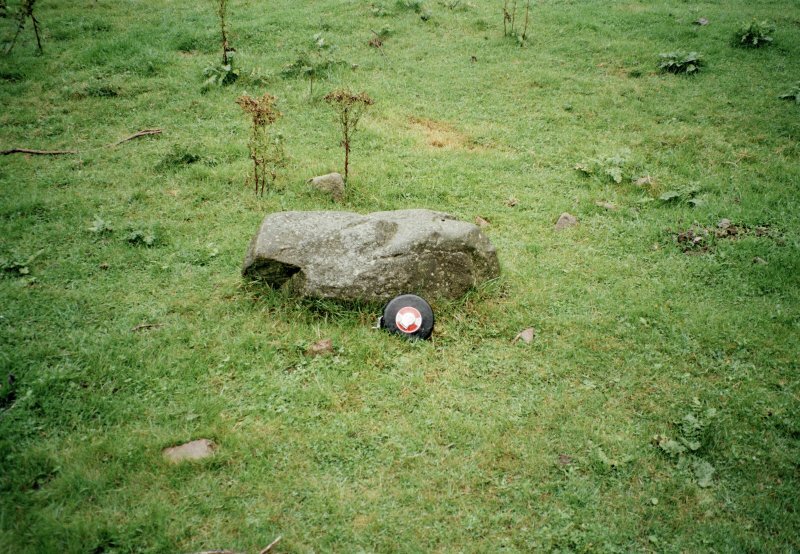 Three other stones have also been re-erected (5, 8 & 9), of which that on the SE (5) was recovered from the floor of the quarry and found to bear a cupmark. With the exception of this stone, which is light grey in colour, all of the others are pale red, and are arranged so that they reduce in height from the two flankers on the SW round to the shortest stone on the NNE (10), albeit that the latter appears to have been decapitated. In a similar fashion, the gaps between the stones also close up towards the NE. The orthostats stand on a stony platform that measures a maximum of 24m from N to S by up to 0.6m in height and encircles a polygonal cairn measuring up to 15m in diameter over a well-defined kerb of granite blocks and slabs; on the SW the kerb turns outwards to meet the back of the recumbent setting. Cupmarks can be seen on two of the kerbstones, one on the ESE, bearing a single cup on its upper surface, and the other on the WSW, with two on its outer face. During the excavations, the monument was completely stripped, revealing that it was far better preserved than was previously thought. Rather than complete excavation, however, Bradley’s objectives were limited to establishing its structural history and chronology, the following account of which is taken from the published report (Bradley 2005). The first use of the hilltop was for pyres, which led to the build up on the old ground surface of a low mound roughly 3m in diameter made up of burnt soil, charcoal and fragments of cremated human bones. This mound was subsequently incorporated into the polygonal cairn, which was constructed to form a relatively level platform on the hilltop. In preparation for the construction of this cairn, a series of steps had been cut into the slope on the SW and layers of turf and soil were deposited behind low banks of rubble, apparently to form a firmer foundation where the margin of the cairn extended out onto the slope. The perimeter of the cairn was revetted with a continuous stone kerb, which was itself buttressed externally by an outer rubble platform. The kerb, which was subtly graded to increase in height towards the SW, had been heavily robbed and of only twenty-five kerbstones that remained, nineteen were still in place. Several arcs of boulders observed in the surface of cairn, elements of which had been identified previously as kerbstones of an inner court (below), proved to be superficial, but there were also up to thirteen radial lines, and at least seven of these proved to be crudely built divisions going down through the cairn material and thus relating to its construction. The outer platform encircled the whole cairn, giving it a tiered profile and forming a substantial feature on the SW. Here the ground is steepest and its clearly defined outer edge included a few blocks of quartz; on the NE, opposite the position eventually occupied by the recumbent, six sherds of Beaker pottery were found beneath the outer platform at the foot of the kerb, while radiocarbon dates from a pit cut into one of the terraces beneath the cairn on the SW produced a series of radiocarbon dates centred on the 25th century BC. The stones of the circle were erected in shallow sockets cut into the outer platform, those of the two flankers being the deepest, while the recumbent had been chocked in position in a shallow hollow between them. Probably at the same time, the kerb of the cairn was reconfigured to turn outwards to meet the back of the recumbent setting, and a straight run of large kerbstones to its rear was removed; the trench from which they were extracted was backfilled with rubble, contrasting with the soil fill where kerbstones were robbed more recently. Once the circle was in place, there is little evidence of any further activity until about 1000 BC, at which date there was a further episode of burning at the centre of the cairn, again associated with cremated bone fragments. More recently still, in the 16th or 17th century AD, a shallow pit was dug into the centre of the cairn. As well as the sherds of Beaker pottery, finds from the excavations included sherds of Late Bronze Age plainware, a possible fragment of daub, quartz, a rock crystal, a number of worked stones (including six flint blades) and some burnt animal bones. 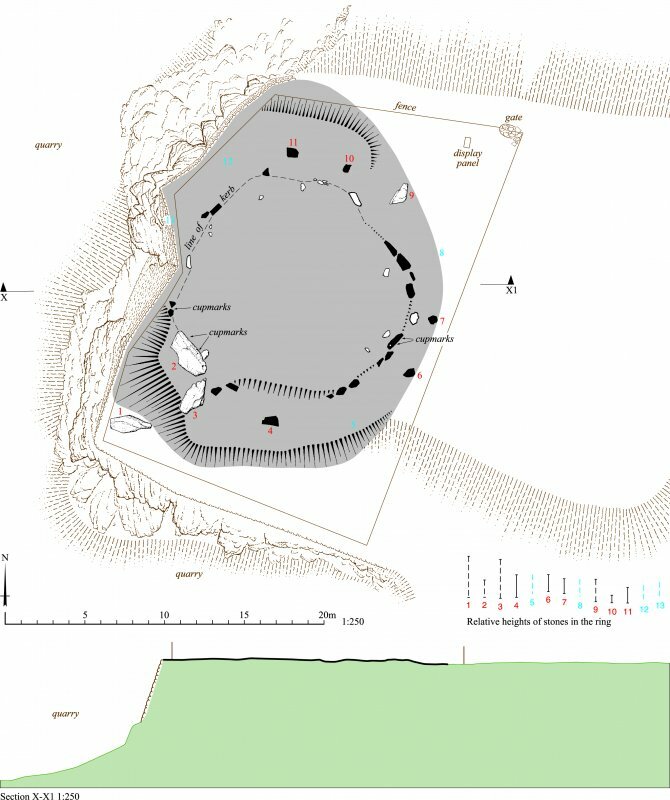 The plan taken by RCAHMS in 1998 (Welfare 2011, 80, 389) was revised to illustrate the character of the ring following its restoration for public display after the completion of Richard Bradley's excavations. The cairn is delimited by the surviving kerbstones and a robber trench that can be traced in the short grass throughout much of its circuit, while the recumbent setting (1-3) and all the orthostats (5, 8, 9) requiring reinstatement (except 12 and 13) have now been re-erected. However, the west flanker (1) has been positioned well back from the recumbent setting (2, 3), which appears to be an error; and it is most unusual for flankers (1, 3) and orthostats (9) to be set with their long axes at right angles to the circumference of the circle. The infilling of the disused quarry to the west of the recumbent stone circle was still incomplete on the date of this visit. Visited by RCAHMS (ATW and AMcC), 9 October 2015. Two new profiles were taken across the restored recumbent stone circle. One runs from E to W for comparison with that taken in 1998, while another runs from NE to SW through the recumbent stone. Visited by HES, Survey and Recording (ATW, AMcC), 7 October 2016.